Ashdown Engineering's PiBass head is the signature model of Polish bass legend Wojtek Pilichowski. I tested it along with the Mi12, a cabinet featuring a 12" speaker. The two products combine to make a 240-watt stack that costs under $900, and has a total weight of under 42 lbs, so it's not hard to see why Audiofanzine pushed me to do this review. TC Electronic BG250-210 Bass Combo Review - Please Turn on Your Cell Phones! It's almost that time of year again and my body and mind are already longing for some well-deserved holidays sitting next to the fire with a hot cup of chocolate. But before that happens and we can all go enjoy ourselves, I will close my short tutorial series. 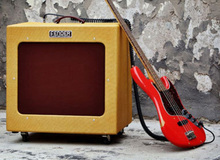 There are a few different reasons why a musician might wish to use multiple amplifiers as part of their rig. Tubes are the El Dorado for all people who think that bass amps were better before. Nostalgics can take their bell-bottoms out of the closet and grow their hair long because all-tube technology is back! Do you feel like a cowboy? Do you like the smell of ponies and old leather? Do you like riding on a weird mount and sweltering under an old stinking hat?